Once the NBA's plucky underdogs, the Los Angeles Clippers have become—thanks to Chris Paul, Blake Griffin and DeAndre Jordan—one of the league's most loathed teams. 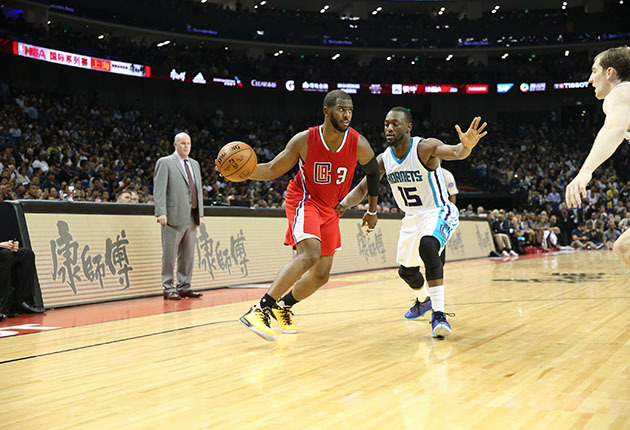 The Cauldron's Joe Flynn has some tips to help turn all you Clipper haters into lovers again. In true Clippers fashion, the franchise spent much of the off-season exploring bold new ways to alienate. ... well, everyone. They may have maintained their contender status by retaining free agent center DeAndre Jordan, but not before turning his decision into an absurd pseudo-kidnapping saga. They added Lance Stephenson, a rare talent who can infuriate fans and teammates even on his good days. On an aesthetic level, they sullied their perfectly fine logo in favor of this slapdash, MS Paint monstrosity. Perhaps worst of all, they covered up Taylor Swift’s consecutive sellout banner at Staples Center. There are certain lines you just don’t cross, people, and trampling on the sacred arena records of America’s sweetheart certainly qualifies. Still, it’s the start of a new season , a time for unbridled joy and optimism. The Clippers will be featured in a truckload of nationally televised games this season, and likely late into the postseason. So it is up to us, the greater basketball cognoscenti, to change the way we watch this team. Here are five techniques that can help you turn even the most grossly Clippers contest into a pleasurable viewing experience. What you actually see: A perfect opportunity to relax into a mindful meditative state. Basketball, like life itself, often unfurls at a hurried, stressful pace. You wake, you go to work, you come home, you watch a bunch of dudes running up and down the court, you go to sleep. There’s no time to sit back, take a deep breath, and calm your harried mind. … Until the opposing coach decides to foul Clippers center DeAndre Jordan again and again—and again and again and again—ostensibly destroying the game’s inherent rhythm and excitement and sending fans into a hair-uprooting rage. But don’t forsake the special gift you’ve just been given—that rare chance to drift into a blithe, blissful trance. Close your eyes, focus on the rhythm of your breathing. Listen to the sounds rise and fall: the ref’s whistle; the chorus of groans; the gong-like clang of Jordan’s wayward try. Picture the whistles and bricks as pebbles tossed into a gentle stream of boos. Now you’re floating leisurely down that stream, without a care in the world. All your worries, qualms, and concerns—all of them careening off you and into the universe, never to be seen again. Just like DeAndre’s free throws. What you actually see: The beauty and majesty of traditional Japanese Kabuki theater. CP3 is, above all, a storyteller. His is a tale of a man getting fouled so hard, in fact, you half expect a crime-scene officer to trod onto the court with a box of chalk. Was he actually fouled? Did the magical fox dressed up as Tadanobu actually fight off that many of the shogun’s soldiers? Like all good art, the truth is open to interpretation. Also: completely fictional. What you actually see: Blake Griffin not appearing in another commercial. There are very few things Blake Griffin cannot do. He’s one of the NBA’s premier talents—a gravity-defying forward as adept at scoring as he is finding the open cutter. He’s also a halfway decent actor ... as far as professional athletes go. But, man, those commercials—they just don’t stop. Viewers are already bombarded with enough uninspired, weird ads. We don’t need to watch Griffin (with special guest Kenneth from 30 Rock!) milking a giraffe (a giraffe that talks! ), or whatever ham-fisted ridiculousness Kia comes up with this season. And we certainly don’t need to see it 20,000 times in a single broadcast. Regardless of how you feel about Griffin the basketball player, every second you spend watching him ball is a precious moment not spent figuring out if what Blake just told Kenneth was funny or not. Maybe it was. I don't know. What you actually see: One man's brave struggle to move his body like an ordinary human. Cole Aldrich is a perfectly serviceable backup center, capable of providing a handful of solid, mostly disaster-free minutes each night. His signing was a real coup for a Clippers squad that badly lacked frontcourt depth in seasons past. More than that, though, this drink-of-water galoot is endlessly compelling from a biological standpoint. NBA players are some of the most graceful humans to grace the Earth—like giant, muscle-bound ballerinas, but with basketballs. And then there’s Cole. As SB Nation’s Seth Rosenthal once put it, Aldrich runs the floor “like a stack of pancakes riding a handcar.” His hook shots are like a medieval catapult: sometimes they hit the target, sometimes they hit a farmhouse 500 yards down the road. You just never know! No matter what move he makes—a defensive switch, a roll to the basket, tripping over his own palms—the man is a da Vincian specimen of human engineering. What you actually see: The NBA’s perfect human. The Clippers sport a pair of widely loathed dudes in Chris Paul and his backup, Austin Rivers, a spoiled coach's son whose face will forever rank among the league’s most punchable—even when he’s retired. The guy didn’t play his first NBA game until the age of 35, and his perpetual pluck and energy are testaments to that sense of carpe diem abandon. Knicks fans adored his hustle and unselfishness to the point of raining downs chants of “Pri-gi-o-ni” during Game 2 of the 2013 Eastern Conference Semis. Hate watching the Clippers complain about every single foul call? Pablo leads the league in post-foul “Yeah, I totally raked that guy in the face” hand-raising gestures. Watching an NBA game—even a Clippers game—should be a celebration of athletic greatness. This is Lob City we’re talking about! Sure, most of the main characters can get so badly on your nerves you want to bathe in acid, but with a few subtle shifts in perspective—not to mention a focus on some of their more charming role players—we can all enjoy watching this team on their inevitable march to the playoffs. Where we still hope they lose.